Detects phospho-caveolin-2 phosphorylated on Tyr 19. Synthetic peptide corresponding to Mouse Caveolin-2 aa 14-25. Our Abpromise guarantee covers the use of ab3417 in the following tested applications. WB Use a concentration of 2 µg/ml. Detects a band of approximately 21 kDa.Can be blocked with Mouse Caveolin-2 peptide (ab4962). May act as a scaffolding protein within caveolar membranes. Interacts directly with G-protein alpha subunits and can functionally regulate their activity. Acts as an accessory protein in conjunction with CAV1 in targeting to lipid rafts and driving caveolae formation. The Ser-36 phosphorylated form has a role in modulating mitosis in endothelial cells. Positive regulator of cellular mitogenesis of the MAPK signaling pathway. Required for the insulin-stimulated nuclear translocation and activation of MAPK1 and STAT3, and the subsequent regulation of cell cycle progression. Expressed in endothelial cells, smooth muscle cells, skeletal myoblasts and fibroblasts. Phosphorylated on serine and tyrosine residues. CAV1 promotes phosphorylation on Ser-23 which then targets the complex to the plasma membrane, lipid rafts and caveolae. Phosphorylation on Ser-36 appears to modulate mitosis in endothelial cells (By similarity). Phosphorylation on both Tyr-19 and Tyr-27 is required for insulin-induced 'Ser-727' phosphorylation of STAT3 and its activation. Phosphorylation on Tyr-19 is required for insulin-induced phosphorylation of MAPK1 and DNA binding of STAT3. Tyrosine phosphorylation is induced by both EGF and insulin. Nucleus. Cytoplasm. Golgi apparatus membrane. Cell membrane. Membrane > caveola. Potential hairpin-like structure in the membrane. Membrane protein of caveolae. Tyr-19-phosphorylated form is enriched at sites of cell-cell contact and is translocated to the nucleus in complex with MAPK1 in response to insulin (By similarity). Tyr-27-phosphorylated form is located both in the cytoplasm and plasma membrane. CAV1-mediated Ser-23-phosphorylated form locates to the plasma membrane. Ser-36-phosphorylated form resides in intracellular compartments. Immunocytochemistry/Immunofluorescence analysis of Phospho-Caveolin-2 pTyr19 (green) showing staining in the cytoplasm and nucleus of HUVEC cells treated with 100µM pervanadate (left) and untreated HUVEC cells (right). Formalin-fixed cells were permeabilized with 0.1% Triton X-100 in TBS for 5-10 minutes and blocked with 3% BSA-PBS for 30 minutes at room temperature. Cells were incubated with ab3417 in 3% BSA-PBS at a dilution of 1:20 and incubated overnight at 4ºC in a humidified chamber. Cells were washed with PBST and incubated with a DyLight-conjugated secondary antibody in PBS at room temperature in the dark. F-actin (red) was stained with a fluorescent red phalloidin and nuclei (blue) were stained with Hoechst or DAPI. Images were taken at a magnification of 60x. 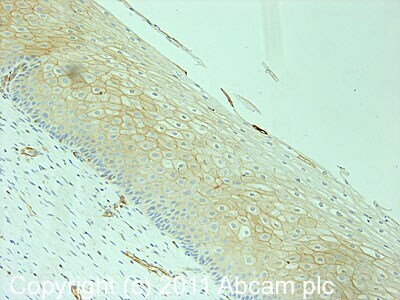 IHC image of ab3417 staining in human normal cervix formalin fixed paraffin embedded tissue section, performed on a Leica BondTM system using the standard protocol F. The section was pre-treated using heat mediated antigen retrieval with sodium citrate buffer (pH6, epitope retrieval solution 1) for 20 mins. The section was then incubated with ab3417, 1µg/ml, for 15 mins at room temperature and detected using an HRP conjugated compact polymer system. DAB was used as the chromogen. The section was then counterstained with haematoxylin and mounted with DPX. 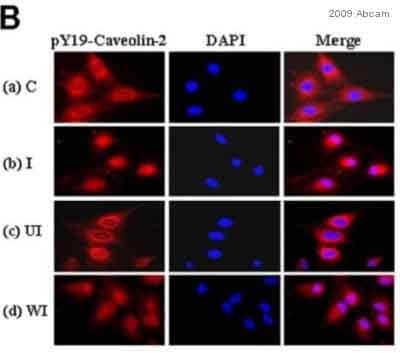 Immunocytochemistry/ Immunofluorescence - Anti-Caveolin-2 (phospho Y19) antibody (ab3417)Image courtesy of Y Pak by Abreview. Publishing research using ab3417? Please let us know so that we can cite the reference in this datasheet.